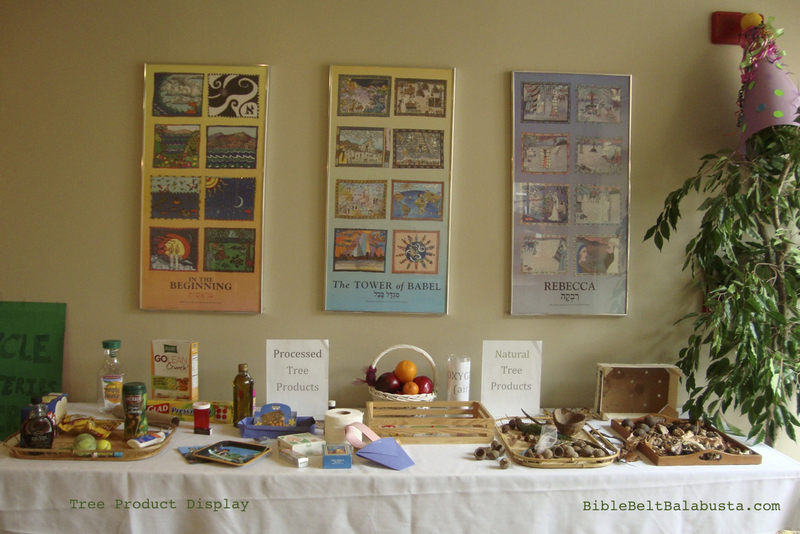 A Tree Products Display for Tu B’Shevat can be an easy, effective way to show All The Things That Trees Give Us. * The display in our school lobby is a magnet: grownups and kids can’t help but fiddle with the hanukkah gelt, glue sticks and pinecones and such. Creating a display can be as quick or as protracted an activity as you wish. You learn, the kid working with you learns, and whomever sees your collection learns. WHY collect a bunch of stuff that comes from trees? 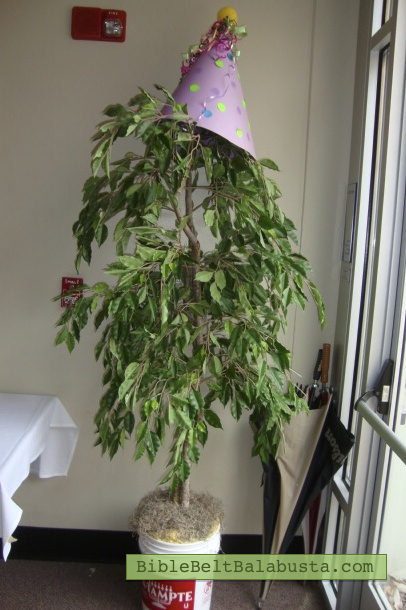 It’s an active, hands-on way to honor trees for Tu B’Shevat, to explore how important trees are to our daily lives, and to instill a desire to protect trees and grow new ones. 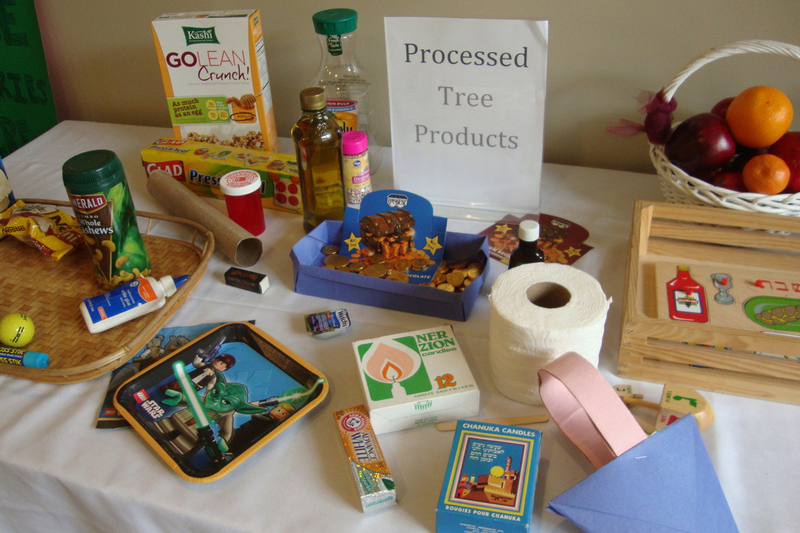 WHAT: Rummage through your house and yard (or classroom and environs) and look, with your child, for “tree products.” Bring a printed sheet from your state’s Forestry website —you will be amazed at the variety and scope (and Scope mouthwash, too, which has tree products in it). Put the stuff on a table. MAKE IT JEWY: Make your display extra, super-Jewy by including Jewish holiday items made from trees: a wooden dreidel, olive oil (for an oil menorah and for frying latkes and jelly doughnuts /sufganiyot), tree-fruit jam for the sufganiyot, a wooden gragger for Purim, candles for Shabbat and Hanukkah, apples for Rosh Hashanah, woven willow basket for some of the Shavuot First Fruits (bikkurim) or for Purim goodies (Mishloach Manot), Sukkot leftovers (some folks keep a lulav and etrog to upcycle at other holidays or rituals), and the wooden spoon for Passover’s Search for Leaven (Bedikat Chametz). Oh, and the cinnamon and cloves of traditional besamim for Havdalah. MAKE IT NATURAL: Don’t forget to add tree products that fall from the actual tree in your actual yard. This year, I devoted half my display table to “Natural Tree Products” and half to “Processed Tree Products.” The best part was when I saw kids and adults holding the sycamore seedballs, huge Bur Oak acorns and tiny Chestnut Oak acorns, catalpa pods, Juniper twigs, etc. 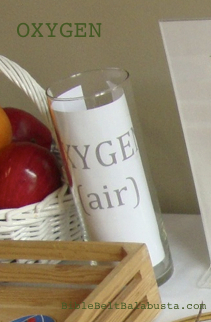 Oxygen—the most crucial natural tree product—can be represented by printing “OXYGEN (air)” in a large font and curling it inside a clear cylinder vase (see pic). One year I had a separate tray of leaves and seeds just from the trees surrounding our synagogue: trees most of us dash past without really seeing. All the Things that Trees Give Us* is a great song to put on the boombox when making a Tree Products Display (see link below). Then again, my Naturalist mentors grumble when kids report that trees “give” anything “to us.” In reality, trees produce stuff, and humans take what we can use. Trees are not producing FOR us. I admit, it’s a good discussion starter, but I’m not going to correct a child who tells me that “trees give us oxygen”—not unless I’ve got time for that ideal discussion. EDIBLE ACTIVITY: Oooo, and here’s a fun, edible component of a Tree Product program: make an ice cream sundae. Why? Tree products are in the box (cone box, ice cream carton, plastic containers), in the ice cream (locust bean gum), in the colored sprinkles (carnuba palm wax), and in the toppings (chocolate, carob, tree fruit, tree nuts, coconut.) Or, you can try the hollow-out-an-apple and fill it with tree fruit / tree nuts buffet, detailed here. And of course, the classic (since Safed) Tu B’Shevat edible activity is the seder. It’s so easy to make these kid-friendly, even if you just pare it down to tasting one new fruit (untasted since Rosh Hashana) and reciting the Shehechianyu. Loads of Tu B’Shevat seder resources here, from Lookstein. LEARN FROM MY MISTAKES: if you do this with a group, make sure that eager little hands are unable to open any container that actually contains something. For example, white glue, maple syrup, apple juice, toothpaste and bless-my-heart, the nail polish. Believe me, it’s worth it to take the time to glue or tape shut lids that are sure to invite curiosity. *All the Things That Trees Give Us, written and performed by Peter Weiss. See his website for free MP3 download of the song and printable lyrics. You gotta love a singing elementary school teacher / Environmental Science PhD. 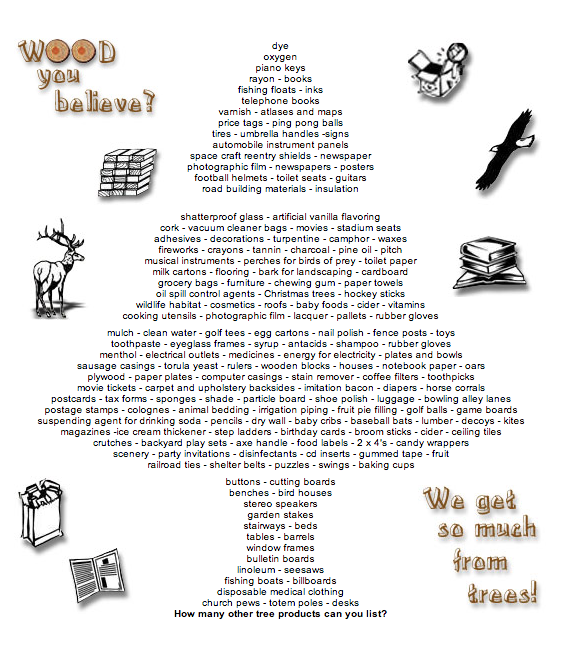 Tree Product Lists: Try Wood You Believe from Idaho, in which product names are formatted in the shape of a conifer. I printed this screenshot to display with my table. The “Almost Everything in the Whole Wide World Made From Trees List” from the Arkansas Forestry Commission. Lists of tree products as lesson plans for Pre-K, 1-8, from the American Forest Foundation. Activities, too. 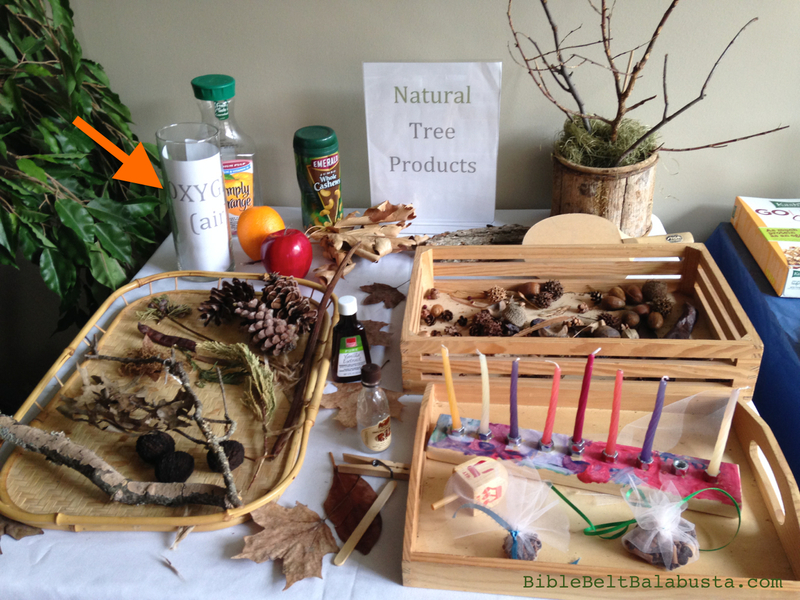 This entry was posted in Nature, Tu B'Shevat and tagged trees. Bookmark the permalink. Superior creative, educational ideas! KADIMA! !